Steven Gerrard after Liverpool lose again. Not a surprise having seen the coaching that they are getting. I recently caught an episode of “Being Liverpool” on Fox. It is a fly on the wall documentary about this season with Liverpool FC in England. As a former sportsman myself I was left astonished at the tiny gap in attitudes and clarity of thought between the million pound-earning premiership and the semi-pro (verging on amateur) rugby that I played ten years ago. The manager/coach Brendan Rodgers is frequently seen giving pep talks to his players during training and before games that leave his players no wiser as to what to do. He strings together generic, vague platitudes that give no direction. His players may be among the best in the world but they are operating in a fast paced, dynamic team environment and even they need something to hang onto by way of nuggets of wisdom, themes to work with. He gives none. If you haven’t seen it this program is not a reality show and, as far as I can discern, this is not an impression created by malicious editing. These are talks to the team just before they take the field. Having been in my fair share of dressing rooms I know that there is little additional time for the manager to get his final points over. He just abjectly fails to convert that time into anything equating to value. I was astounded. I had a coach like that in 1997 and we thought that he was actually suffering from some early stages of a mental disorder his talks were so vague and pointless. Mr Rodgers is, I hope, not suffering from any condition other than being put in charge of the hopes and dreams of hundreds of thousands of people and just not being up to the task. I see today that Liverpool lost again in an important match, having been ahead. My money is on one of two things happening – Brendan Rodgers is quite correctly sacked before the end of October or Liverpool finish in the bottom half of the Premiership for the first time in decades. Top quality teams simply cannot thrive with such an abject lack of clarity and direction. I see that he has apparently delivered a 180 age manifesto detailing roles and responsibilities within the team but based on what I saw in the footage I have seen, the fact that he was hired on the basis of that manifesto speaks more to his writing skills (or that his audience were too busy to read it) than his other communication skills. It would be the right thing to do to get so granular but sadly the execution seems lacking. But how does this relate to you and your business? Well, are you being clear with your teams (employees, consultants, alliances) about what it is that you need them to do? And using terms like “do your best, have fun, the result will be a win.” does not cut the mustard. What does “step up” mean specifically? (BTW that is a commonly vague management term not a direct Rodgers quote) No matter how good your team are, unless you are clear about your expectations they WILL disappoint you. 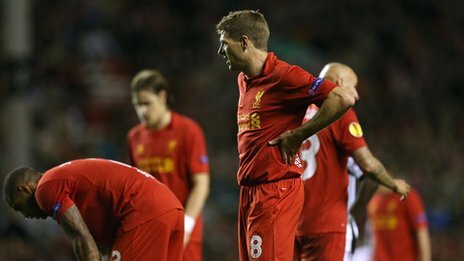 If you are a Liverpool supporter I am genuinely sorry for your loss and I hope to offer a retraction to this post within weeks. I don’t think that I will have to though.